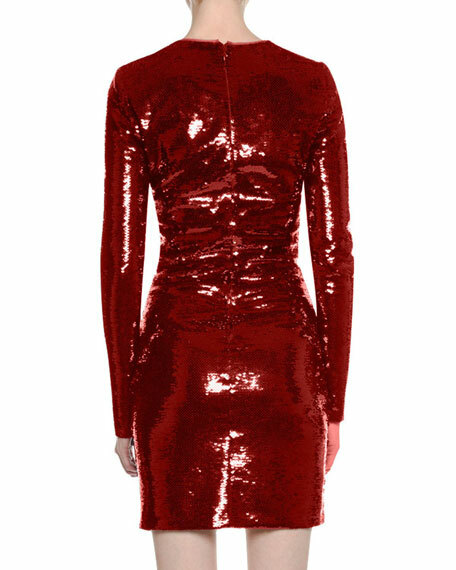 Tom Ford liquid sequin cocktail dress. Approx. 32.2"L from shoulder to hem. David Meister cocktail dress in stretch jersey. Sheer mesh contrast with floral embroidery. Round neckline with strapless illusion. Long sleeves. David Meister cocktail dress in stretch jersey. Sheer mesh contrast with floral embroidery. Round neckline with strapless illusion. Long sleeves. Fitted silhouette. Hem hits knee. Back zip. Rayon; lining: polyester. Imported. Model's measurements: Height 5'10"/177cm, bust 33"/84cm, waist 25.6"/65.2cm, hips 35.8"/91cm, dress size US 2-4/FR 34-36. Lela Rose lace cocktail dress. Jewel neckline with sweetheart illusion. Long sleeves. Sheath silhouette. Hidden back zip. Mid-calf length. Polyester/nylon. Lela Rose lace cocktail dress. Jewel neckline with sweetheart illusion. Long sleeves. Sheath silhouette. Hidden back zip. Mid-calf length. Polyester/nylon. Lining, polyester. Made in USA of Italian materials. Model's measurements: Height 5'10"/177cm, bust 33"/84cm, waist 25.6"/65.2cm, hips 35.8"/91cm, dress size US 2-4/FR 34-36. Lela Rose cocktail dress in stretch-wool. Square, bateau neckline. Long sleeves. Sheath silhouette. Fitted. Hidden back zip. Midi length. Wool/nylon/spandex. Lela Rose cocktail dress in stretch-wool. Square, bateau neckline. Long sleeves. Sheath silhouette. Fitted. Hidden back zip. Midi length. Wool/nylon/spandex. Made in USA of Italian materials. Model's measurements: Height 5'10"/177cm, bust 33"/84cm, waist 25.6"/65.2cm, hips 35.8"/91cm, dress size US 2-4/FR 34-36.